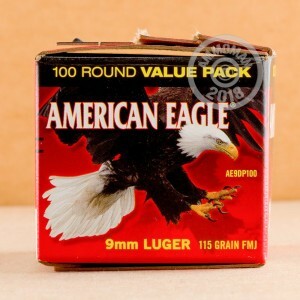 This 9mm Luger ammunition from Federal is a great way to get some trigger time on the cheap without compromising on ammo quality. Manufactured by Federal of Anoka, MN, these cartridges are a standard pressure target load ideal for pistols of all sizes, from all-steel Hi Powers to subcompact M&P Shields and Glock 26s. 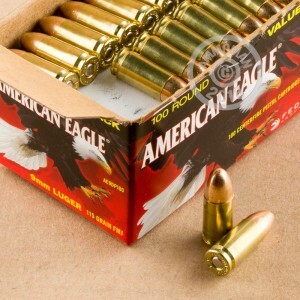 Each round in this box of 100 fires a light 115 grain full metal jacket bullet. These cartridges use non-corrosive Boxer primers and brass cases. Pick up a few of these boxes or browse the rest of AmmoMan.com's great selection--if your order total exceeds $99, we'll waive the shipping and handling charge! Awesome produts !! Great prices...Thank You ! Ammoman is the best place to get ammo from !!! Fast shipping, great price and customer service hands down !!! I'll ALWAYS reorder from YOUR site ! Thank You !! Purchased this ammo for range use. Ammo performed with no problems whatsoever. AmmoMan was easy to order and shipping was great. Will use again! This was my first purchase on AmmoMan.com. I will DEFINITELY be purchasing again for several reasons; quantity, price, and shipping. Prices for quantity offered are unheard of, ships free with $99+ purchase (got mine in less than 2 days). I haven't gotten to the range yet but there is not doubt in my mind the ammo isn't the same as it would be anywhere else. I should also note packaging of product was secure, SAFE, and neat. Order arrived within 2 days of placing it. Very impressed with this company and their service and shipping!! No missfires -shot clean /would order again. My first ammo purchase with my new sweet virgin Glock 19. The ammo shot perfectly. Ordering was simple, fast and discreet packaging. I had no issues and will be ordering the same again soon. This was my first purchase from Ammoman. I am happy with my purchase and hope to do business with Ammoman again.